The night before our fifth day was our dinner reservation at the home of an American chef and his Peruvian partner. We were one of the first to arrive, just behind us a couple from New Jersey. We were welcomed inside to the living room that looked out into the wet patio from the rain, but green and lush. We introduced ourselves to the other couple and walked past the dining room table set for 8 guests with all of the formal place settings. We chatted and stood in the living room and within minutes, they brought out a silver tray of four cocktails for us, made with gin and grapefruit juice. A little something to taste before our 5 course meal and wine pairing, and a little something to hold on to while we chatted. Behind the tray came the rest of the attendees, from Manhattan, London + Boston, and London + Chile. Of course, we all knew each others names at this point, but for the sake of writing, where they're from as their names works easiest. We all spoke about when we arrived, what we've done so far, the plans for the rest of our trip, and how we came to Casa Saltshaker. 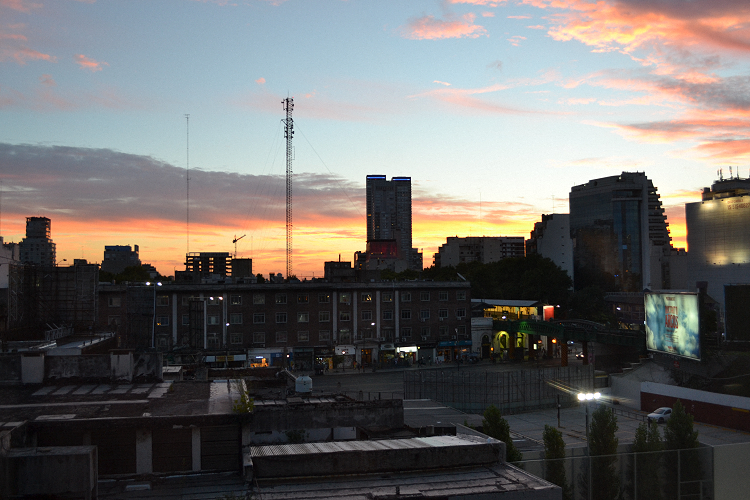 A few guests already did the Buenos Aires bike tour, which sounded great! It was one thing that we wish we did in Paris when we were there. Other couples have plans to go to Patagonia, and I really had no idea how popular of a destination Patagonia would be. After chatter and infrequent pauses in conversation, it was time to go to the dinner table. We all sat in our pairs, but there was no assigned seating. We started off with ratatouille paired with a sparkling wine, then enjoyed a chilled avocado soup with corn gelato in the middle, there were two fish dishes, one paired with a rose Malbec and the other paired with a red pinot noir. We ended with a lemon and olive oil cake as dessert. There wasn't anything too frou frou about the dishes; everything was just good, honest, home-cooking with wonderful ingredients. My favorite was the soup because I have never had anything like it. It was spicy enough and I loved that the chef shared with us that he and his partner often have soup together. It was like sharing a little bit of their home even more. 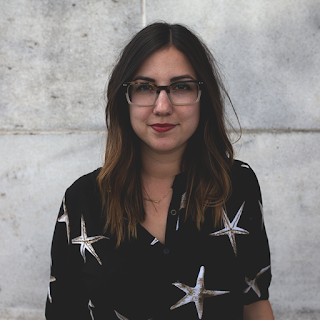 We all talked pretty effortlessly, asking about each other, what we all do, and about our past travels. I really enjoyed myself and wanted to continue hanging out with our new "friends" even after the dinner! But it seemed no one was interested in going out again, but considering that we were there from 9 pm to midnight, I can understand. I do wish I took more photos than of just the dishes on my phone, but it was one of those things that it didn't seem like that many people were interested in taking photos. Either way, I can remember the lighting, the design of the ceramic plates, the spicy soup, and the low ceiling of the dining room that made it that much cozier. 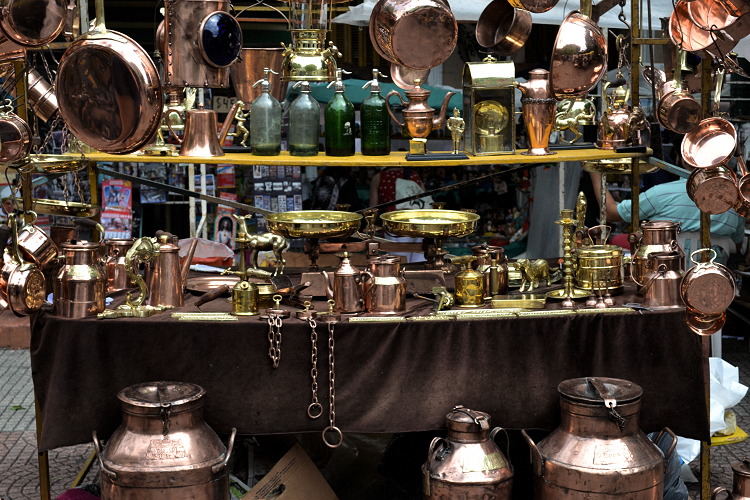 Then, on day five, it was the Sunday Antiques Market in San Telmo! Before heading to that part of town, we brunched at Olsen, a Scandinavian restaurant that has wonderful reviews online and was a little something different than the empanadas and meat we've been eating. We ate simple brunch with salmon, pork shoulder, eggs, and salad, plus a glass of champagne for me since brunch isn't really brunch without bubbles. The pork shoulder was some of the most tender meat I've had here! 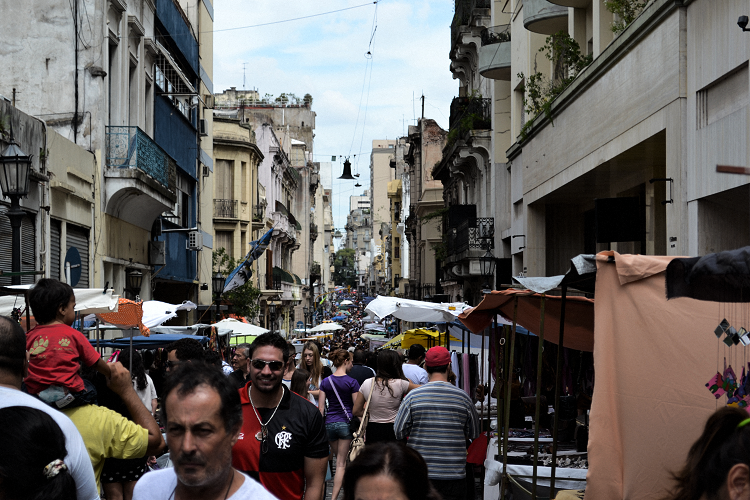 In San Telmo and the market, we started at the northern end of the street Defensa, which is full of vendors and shops and people leading up to the Plaza Dorrego, where the antique booths are set up. 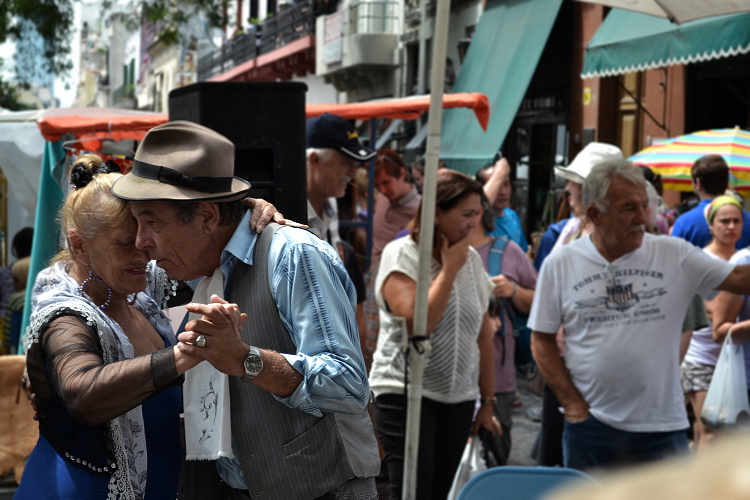 It was a long and eventful walk full of musicians performing, tango dancers, comedians and street performers, and local characters serving their fresh pressed juices or staring out from their cafe doors into the lively streets. We have plenty of video footage to share with you so that you can get more of a sense of this action. It is really best translationed in moving pictures rather than still images that lose the life of the streets. 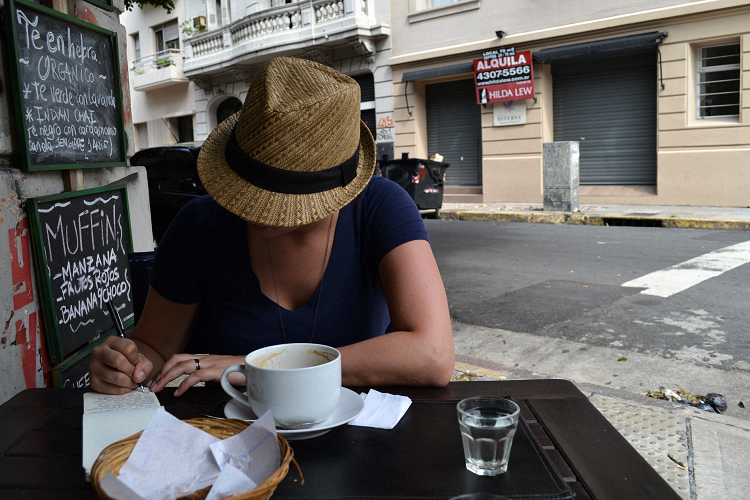 In our normal fashion, we stopped in the afternoon at a cafe for cafe con leche and medialunas (croissants) and took the moment to rest our feet and I wrote in my moleskine, catching up on the details before moving on to the next. 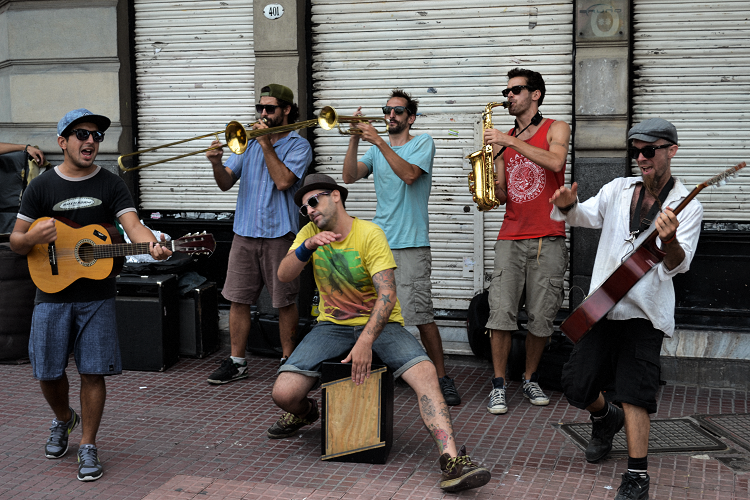 We were in San Telmo during a week day too, and it is amazing the difference in crowds. During the week, it is all business men walking around, taking their lunch breaks in the restaurants. On the weekends, all the streets (except for Defensa) are quiet, and the only people in this area are those who are going to the market. In order to keep up with the locals late dinner of 9 pm and our jam-packed days of action, we've been napping any where from 5 pm to 7 pm, giving us a little siesta before we get back up and moving. 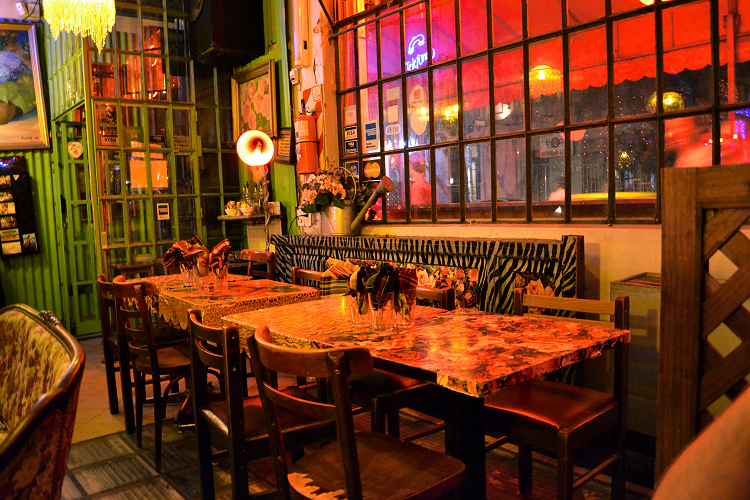 We went back to Acabar to enjoy some delicious empanadas, some chips and salsa and queso, and of course, the hard-to-resist bottles of $4 Argentinian wine. no no - honeymoon time was well had and i thoroughly enjoyed an hour a day to breathe and just write in the afternoons. i'm sure you would do the same! all those copper pots! now i know where you get your affection for copper pots from. those are so gorgeous! they were so pretty and i wish i could have brought more home without weighing down my suitcase!